The Tomato Clownfish is one of 27 known Clownfish species. 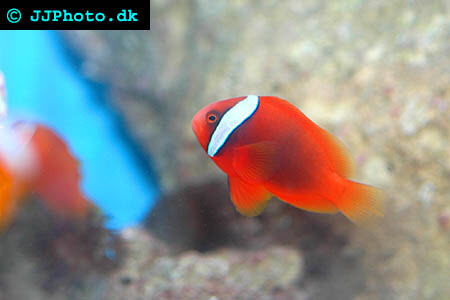 Its scientific name is Amphiprion frenatus and it is also commonly known as Tomato Anemonefish. 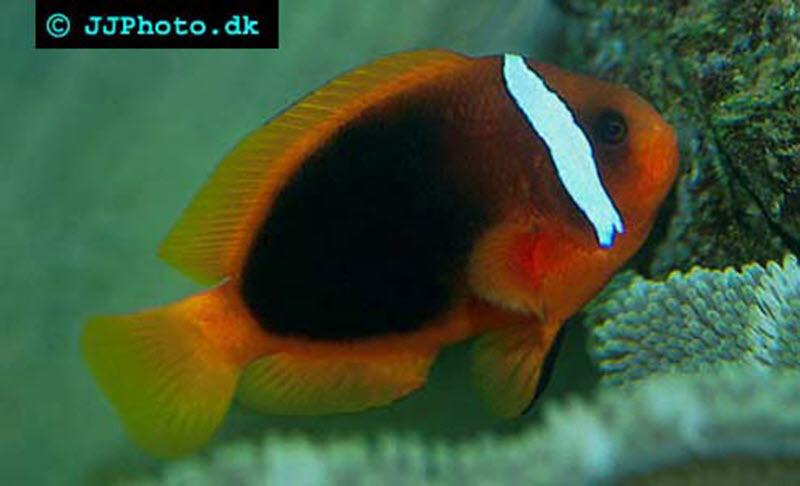 The Tomato Clownfish belongs to the subfamily Amphiprioninae in the family Pomacentridae. Clownfish co-exists with anemones in the wild and can shelter from predators near the anemone without being stung or eaten. All the clownfish species are very colorful and they are immediately spotted and subsequently eaten by other fish if they leave their protecting anemone. The female Tomato Clownfish is significantly bigger than the male Tomato Clownfish and is blackish on the sides of the body, while the snout, belly, and breast are red. The male is without this blackish coloration; his entire body is red and he has one single white head bar. A young Tomato Clownfish has 2-3 white bars. Wild Tomato Clownfish is found in the Western Pacific. They are popular in saltwater reef aquariums and will typically reach a length up to 5.5 inches. You will need at least a 20-gallon aquarium to house your Tomato Clownfish in, and the aquarium must be filled with lots of hiding places. Live rock growth is also advisable since the Tomato Clownfish likes to graze. Wild Tomato Clownfish will try to find an anemone belonging to the species Heteractis crispa or Entacmaea quadricolor. Anemones can be quite difficult to keep alive in the aquarium, and your Tomato Clownfish will survive without one since you can keep the aquarium free from predators. If you give your Tomato Clownfish a new anemone from a new species, it will take several days before the fish has grown accustomed to the anemone. If you give your Tomato Clownfish a new anemone from the same species as the fish is already familiar with, no such adjustment period will be required. Keep in mind that some anemone species are unsuitable for Clownfish and will sting and injure the fish. Tomato Clownfish can show some aggressive behaviors when it reaches maturity, especially towards other Clownfish. It is recommended to keep this fish alone or in mated couples. The Tomato Clownfish is an omnivore opportunist and will usually show a healthy appetite when kept in an aquarium. Provide your Tomato Clownfish with a varied and nutritious diet that includes meaty food types as well as some algae or algae-based food. A high-quality flake food designed for omnivore fish can be a good base. Feed your Tomato Clownfish 2-3 times a day. Tomato clownfish – Amphiprion frenatus. Copyright www.jjphoto.dkA Tomato Clownfish will usually adapt well to life in an aquarium, but you should ideally have some previous experience from saltwater aquariums before you buy your Tomato Clownfish. When Pixar Animation Studios released a film called “Finding Nemo” in 2003, the surge for Clownfish increased dramatically and a lot of people bought their own ‘Nemo’ without realizing that keeping a saltwater aquarium is very different from keeping one with fresh water. The film features a Clownfish trying to rescue his son from an aquarium, and at the end of the film, the young Clownfish manages to escape back into the ocean by being flushed down a toilet. Unfortunately, some aquarists still think this is a good method of getting rid of living fish. No fish species will survive being flushed down a toilet and into a sewage plant, and certainly not a saltwater species like the Clownfish. There are other ways of euthanizing a fish that involves less pain and stress for the fish.